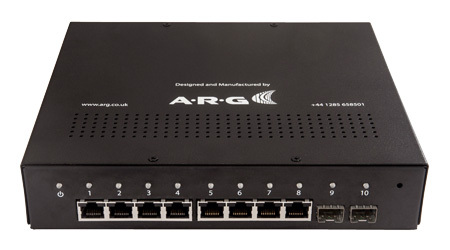 The ARG Quarra 10100 is a PTP-Smart Ethernet switch for use in Audio-over-IP and Video-over-IP networks. The 10100 is a ten port switch fitted with 8 RJ45 Ethernet ports and 2 SFP ports that can be optionally fitted with fibre-optic or RJ45 Ethernet SFP transceiver modules. There are two versions of the Quarra 10100. A 1U rackmounting version that also benefits from dual-redundant power supplies and desktop version. Precision Time Protocol (PTP) is the technology that synchronises all systems and devices in audio, video and media IP networks. The ARG Quarra network switches are the first of a new generation of PTP-Smart switches that guarantee the best possible quality, resilience and durability of sync and timing in broadcasting and media IP networks. Quarra switches incorporate the standard functionality of a carrier-grade Layer 2 and Layer 3 Managed Switches including Quality of Service (QoS) and IGMP multicast management services that are crucial to media network operation. The variable and non-deterministic nature of IP network environments mean accurate and stable sync and timing is even more important in networked systems than it is in conventional broadcast or production systems. Most professional media network standards for audio and video employ the Precision Time Protocol (PTP/IEEE1588) time and sync protocol to synchronise all devices across the network. However, mission critical broadcast, production, safety and live network systems require specialist PTP-Smart network switches for correct PTP timing and sync data handling, which results in the best possible sync accuracy and optimum network and system performance, stability and capacity. This is especially important as high-res video streams and increasing audio channel counts test network capacity and where crucial roundtrip timing is important for monitoring or musical timing. Inherent variations in network traffic transit times across the network result in increasing levels of jitter at each and every slave in the system, which require extended input and output buffer delays to prevent signal distortion and corruption due to missed or repeated samples. Real-world symptoms of not paying sufficient attention to reducing these timing variations are many and various, but include restricted network capacity, distorted or corrupted signal streams, delay problems for performers’ or contributors’ monitoring, slack musical timing etc. etc. A simple and easy to implement solution that reduces these variations to theoretical minimums is the inclusion of ARG PTP-Smart switches. The ARG Quarra switches provide the essential Quality-of-Service (QoS) and IGMP multicast management to extract the best sync and network performance for all audio-over-IP protocols, including Audinate Dante, AES67, Ravenna and Livewire. For the PTPv2 protocols such as AES67, Ravenna and Livewire in the audio world and SMPTE 2110 or SMPTE2022 in the video domain, the ARG PTP-Smart switches add a further three PTP-Smart strategies for the most effective reduction in timing variations and jitter– Boundary, Transparent End-to-End (E2E) and Transparent Peer-to-Peer (P2P) clocks that each deliver a further improvement in sync and timing performance. In Boundary Clock mode, the switch itself undertakes a single PTP conversation with the network GrandMaster to which it slaves and then holds individual and local Master-to-Slave conversations with each connected slave device and any further downstream switches. For Transparent E2E clocks, the Quarra PTP-Smart facilities employ dedicated additional hardware and processing within the switch that reads and updates the PTP packet data at the IO ports to correct for the inevitable variations in transit time through the switch due to other network traffic. For networks that employ exclusively PTP-Smart switches, Transparent P2P adds further sync “connections” which derive tighter sync performance with other “network adjacent” devices. Adopting a PTP-Smart strategy with ARG switches delivers significant improvements in sync performance and accuracy with consequential improvements to signal quality and network capacity, stability and resilience. These benefits may be realised where the ARG Quarra PTP-Smart switches are employed as the core switch components in an audio or media-over-IP network or as “edge” devices delivering the benefits of PTPv2 sync within an otherwise non-PTP enabled network. Quarra PTP-Smart switches may be equally effective, especially in high capacity networks carrying the latest 4K/UHD/HDR media streams, when deployed in a separate sync, control and monitoring network to provide improved stability and resilience compared to an all-in-one network. This may also have the added benefit of avoiding the additional cost of deploying universal PTP capability within the main media network.